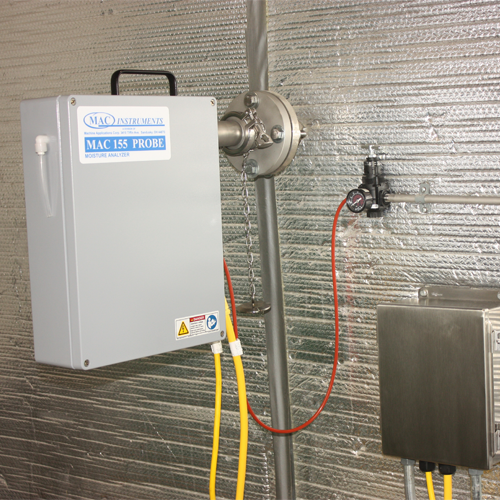 The MAC 155 moisture/humidity analyzer enables you to augment your process safety and comply with US EPA regulations. Several high-quality components such as a humidity probe and humidity transmitter combine to make this device exceptionally user-friendly. 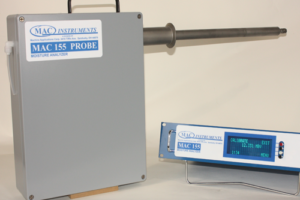 MAC 155 is used in industrial operations worldwide for 24/7 monitoring of stack emission gases. It is designed for measuring humidity in exhaust gases in temperatures ranges up to 1200°F (650°C). MAC Instruments also provides a range of special accessories to expand the usability of the humidity probe in temperatures up to 2400°F (1300°C). A defining attribute of the MAC 155 humidity transmitter is that it features an in-built calibration system. This makes daily 2-point in-situ calibration and system checks possible, and facilitates adherence to US EPA regulations and local mandates pertaining to exhaust stack installations. The humidity probe is protected from particles by a 10 micron stainless steel sintered filter element that can be easily cleaned and replaced. The humidity probe on this unit is exceedingly sensitive to water vapor/humidity. However, it does not rely on a wet bulb, mirrors, optics, chemicals, or compressed air to provide readings. This humidity meter is highly responsive to the partial pressure of water vapor, thus displaying instantaneous readings. You can confidently depend on MAC Instrument’s patented solid state design to help you improve overall process efficiencies in the toughest industrial settings. 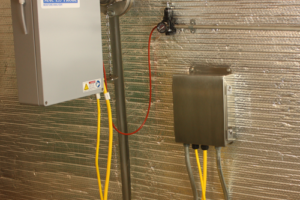 The MAC 155 humidity transmitter is available in two models for low range and high range continuous humidity monitoring. Sensor signal substitution can be externally initiated to generate an ouput signal 50% of full output. From the MAC155 Controller, 3 different output signals can be generated. Provides a method of checking total system includingdata aquisition equipment. 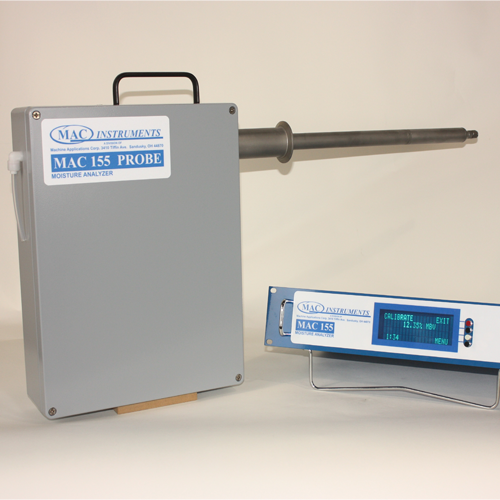 The MAC 155 In Situ Moisture Analyzer is designed to continuously monitor emission stack gases. 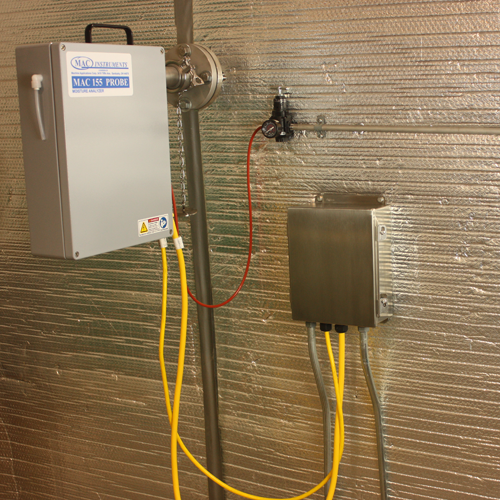 It is designed to meet EPA and local regulatory requirements for stack gas moisture/humidity measurements. The patented solid state design has been proven in hundreds of industrial process control applications. The moisture sensor is extremely rugged and requires no chemicals, compressed air, optics or mirrors. The % moisture by volume is measured using a proprietary high temperature capacitive sensor that responds to water vapor pressure in the presence of other gasses. 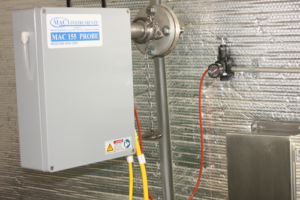 The MAC155 Moisture Analyzer used as Humidity Transmitter is provided with automatic two point calibration check at user selectable humidity levels. The on board calibration system can challenge the sensor with a controlled water vapor sample. An internal tank holds enough water to generate vapor samples for one year of daily calibration checks. View the MAC155 data sheet in pdf form.